What Price, Running? (1) – Eat. Sleep. Burn. Repeat. Whoever said running is free or cheap deserves a smack. A big one. 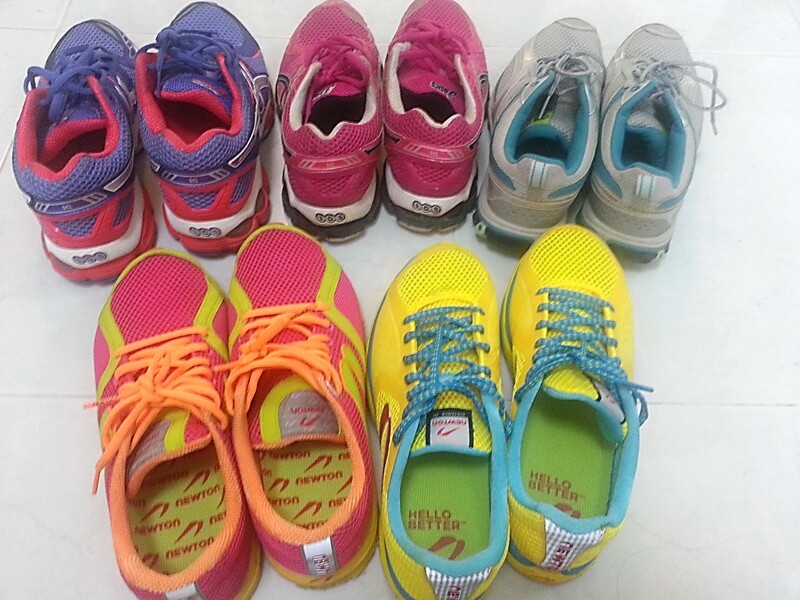 Mind you – missing from the photo is another pair of Newton Distance U, and it’s the exact same pair as the one in orange, and which I leave at the gym in my shoe locker. I used to think running was easy – I mean, what’s so difficult about it, right? Just slip on your trainers and GO. You see, with age, the knees feel everything. And they complain a lot. At least, mine do. And the left ankle too. And the back. And oh, the glutes. What and who am I kidding? The whole body feels it. So when I (re)started running last year I wanted to make sure that I did it sensibly- and this meant going to get my gait analysed so I get kitted with the ‘right’ shoes. And so I got my first pair of Asics (the ones in pink). Then I decided to buy a spare pair to keep in the gym (I hate lugging stuff around) and got a similar pair in purple. Then Timberland had a big sale on and I figured that since I would be exploring the trails in Hong Kong I should buy a pair of trail running shoes. Which to date I have only used in HK. Thank goodness they were cheap. The shoes I mean, not the trip. SMH. So the cute ones I had been wearing were apparently all wrong. Sigh. Dear Friend then got me some Balega socks (flown all the way from USA, ok?) which worked magically. I then became a convert and ended up going on a socks buying spree, but since Balega wasn’t available here I settled for Injinji socks instead. I don’t know really if it’s psychological, but there seems to be a huge difference between wearing the 3-for $10 oh-so-cute-H&M socks and these. At least the blister situation improved. But my wallet felt the pain. I was fine with my set up for a while … then came the training for the half marathons. And this was when I was introduced to Newton shoes and my first pair was the Distance U.
I loved them. So light and easy to run in.. but I must say.. the colours are a bit… erm… loud. Way way way louder than what I was used to. I mean… seriously – bright orange and fuchsia – garish, much? Gulp. Anyway, once I ignored got used to the colours I found I really liked running in them, and like the Asics, bought another pair to store in the gym. These pairs got a lot of action – I ran both the StanChart and 2XU half marathons in them, so they have quite a bit of mileage clocked. The latest addition, I must admit, was somewhat done frivolously – I had been invited to the launch of the 5-lugs shoes two weeks back and was gratified to see shoes that were actually pretty and where the colour combinations made sense and so, bought the Distance III. Took them out for the first time today and they were awesome. Amongst all the shoes I have they are the lightest, and yet felt stable. So the plan is this – I would still use the Asics, but for solo runs (short distances ie 5- 7 km), the Distance Us (for anything above that), and the Distance III for actual races. Good for my feet, and my heart feels better about the money spent – on my feet, anyway. But seriously, the expenses don’t stop here. Cos these are just SHOES. Coming up – the other expenses, and a rant against developers who think non-iOS users are non-human. I shared your experience with trail shoes. Trail running seems like such a good thing to do. I bought a nice set of new balance trail running shoes, and used them once. Though I have started using them for our Friday morning hill runs, which are the closest I’ve come to a trail run since buying them. But I also bought some of the barefoot type 0-drop shoes, and the first time I ran with them my knees were sore for a couple of days. Then I realised I’d been running wrong and my super padded shoes had been covering it up. With the lightweight shoes I can feel it when I get tired and lazy and the technique seems to slip. So I have a few pairs of shoes now. Haven’t got into the special socks yet. I did notice one morning someone running with what looked like special running gloves. I thought that was silly. Then a few weeks later it was particularly cold and I thought, boy it’d be good to have some gloves that were wind and water proof but still light enough to use your phone with. Ooohh… I now have running gloves. Crazy huh. But I do like them. So now running gloves are perfectly OK! Am so gonna check those out 🙂 What’s your recommendation?